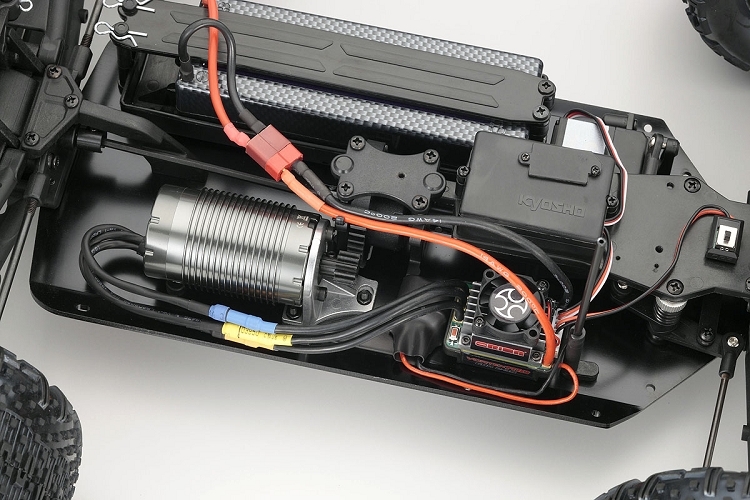 Brushless motor power and lightweight chassis lift performance above its class. Pushes EP monster trucking beyond the bounds of common sense! A full time 4WD drive train is turbo boosted with an ORION Vortex Experience brushless motor and Vortex R10 ESC with cooling fan combination to produce simply breathtaking power. You can feel the relentless torque from the instantaneous burst of acceleration all the way through to the top of the speed range. 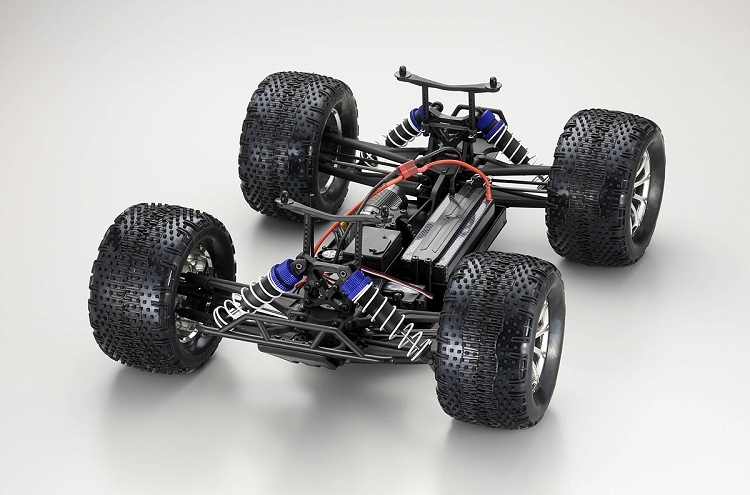 The benefits of Kyosho’s unique knowledge in electric buggy design are fully realized in the DMT through the powerful drive of the big tires and nimble control characteristics. Also, the pre-installed 2.4GHz R/C system that removes the need to manage frequency bands puts the next generation of monster truck performance in your hands. 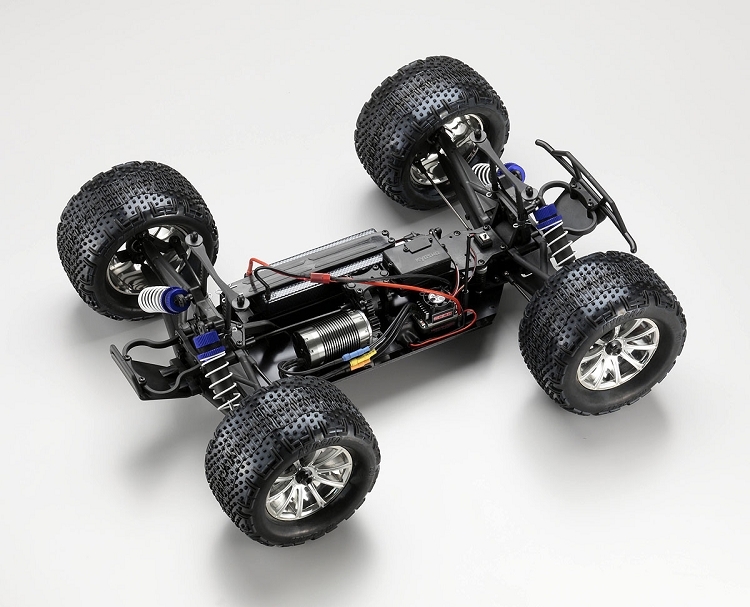 Full-time 4WD chassis incorporates all of Kyosho’s formidable resources and knowhow in the development of this low center of gravity shaft-driven 3-differential drive train. ORION VORTEX 10 EVO brushless motor is pre-fitted on an aluminum die cast motor mount and allows gear backlash to be easily adjusted with just three screws. Equipped with ORION VORTEX R10 (with cooling fan) ESC that automatically sets its neutral position when the power is switched on. Features wheels from the Inferno ST-RR and combines with high-strength 17mm hex hubs to deliver sure-footed traction. Can be used with either a 7.2-8.4V NiMH or 7.4V Lipo battery. Release the throttle and switch the power on to complete auto setup. Big bore oil shocks with built-in diaphragms on all wheels deliver reliable damping while removing the effects of volume change during suspension stroke. Equipped with dial type adjuster on shocks to provide easy adjustment of chassis height. *Pre-cut body is complete with vivid printed color scheme. *Design provides wide scope for setting adjustments such as suspension settings including chassis height, camber, tread, and front/rear toe-in. *Steering linkage enables wider steering angle. *Features reinforced 3mm hexagonal drive shafts. *Features dust proof radio box. *One-piece battery box provides secure mounting. *Extra strength is realized by the machine cut steel differential ring gear. *Large micro pattern tires combine with 17mm hexagonal hub type wheels to realize great running power. Optional monster truck tires can also be used.